All kinds of books. We have hundreds of them at home. 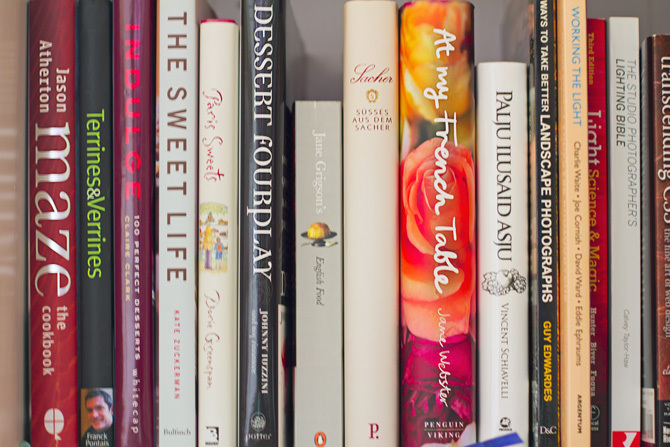 My granny must have started it all, the house was always full of books and one of my first activity of choice was climbing up the bookshelf and browsing through books, cookbooks in particular. Me and my brother would rate photos found in cookbooks or on recipe cards and discuss at length about the tasty and icky bits. I must have been about three or four. I enjoy a good fantasy novel, from the likes of Tolkien, Pratchett, Trudi Canavan or just about any fantasy book that catches my attention. Recently there have been many new authors in this field who just seem to have squeezed a story out of a pen where there isn't anything there. A good travelogue never goes amiss either. Peter Mayle's books certainly did set the bar here, I read each and every one of his Provence novels about five times, addictive! In order to maintain some living space in the house I have stated some clear rules about buying cookbooks and I try to stick to them. First off, metric measurements. No matter how fine the book, if there are no metrics, drop it. Secondly, hardbacks. Hardbacks have a much longer life, you can pass these on to your grandkids, sell for a few bob or donate to charity once you're bored with it. Last but not least, good photography and design. A dull, poorly laid out book is not going to inspire you much, is it? So why bother? 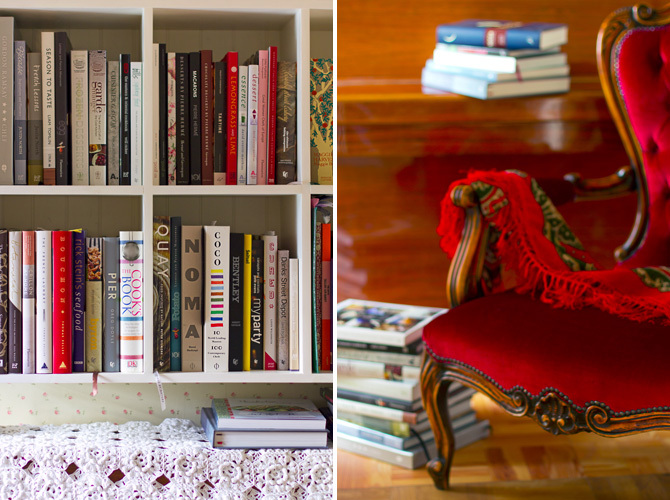 I also tend to avoid impersonal collections of recipes or books without any distinctive style or personality. Sometimes a book full of character can outweigh the lack of photographs, for example Suzanne Pirret's "The pleasure is all mine". It is right out hilarious! Some cookbooks I bought last year - "Bocca" (very lovely book, well pleased), "The modern pantry" (this book offers more of a fusion cuisine, interesting take on flavours), "Japanese cooking" (old and classic), "Notes from a Swedish kitchen", "Yoshoku", "Malouf" (I was thinking of getting one of their other books, but then noticed this collection got published). I saw this technique for caramelising white chocolate a while back on mister Lebovitz's blog. Didn't think much of it at the time since I'm not big on such sweet things but when I started making chocolate spreads to give away as presents, then it came to me, why not use something other than regular chocolate? First, turn the almonds into a paste. Whiz in a food processor until completely ground, then add about one quarter of the cream. Keep whizzing and scraping until it forms a paste. Pre-heat the oven to 120°C. Chop white chocolate into small pieces, scatter on a parchment-lined baking tray and pop in the oven for about 45-50 minutes, mixing with a spatula every 10-15 minutes, until it turns light brown in colour. Don't worry if it looks a bit dry and crumbly, it will even out later. Mix the caramelised chocolate into the almond paste, smoothing out any reluctant chocolate bits with a spoon. Next start adding the cream, one third at a time. Mix it all into a smooth and even mass. Scoop into sterilised jars. It will harden once chilled. Should make about 700ml. Found your blog via Tastespotting. 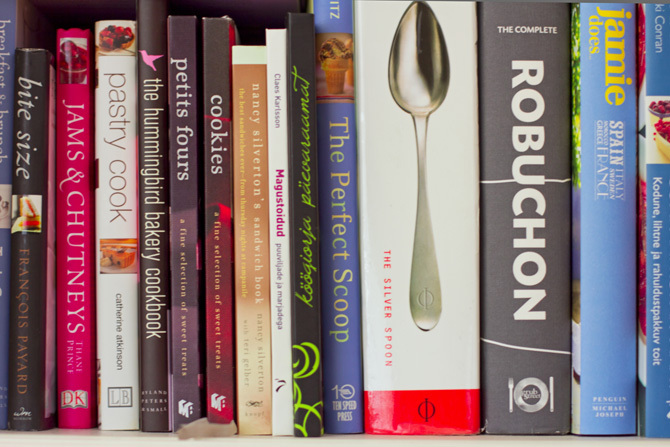 Very lovely work, and I agree with most of what you said regarding preferences in cookbooks. They are my new obsession! Seda valge šokolaadi ahjus karamelliseerimist tahtsin minagi proovida, lihtsalt pole veel jõudnud. Tundus lihtsalt nii põnev. David vist soovitas mingi kindla kakaovõisisaldusega šokolaadi ja mu valged Callebaut' graanulid olid lahjemad - seepärast jäigi vist pooleli. Mida Sina kasutasid? 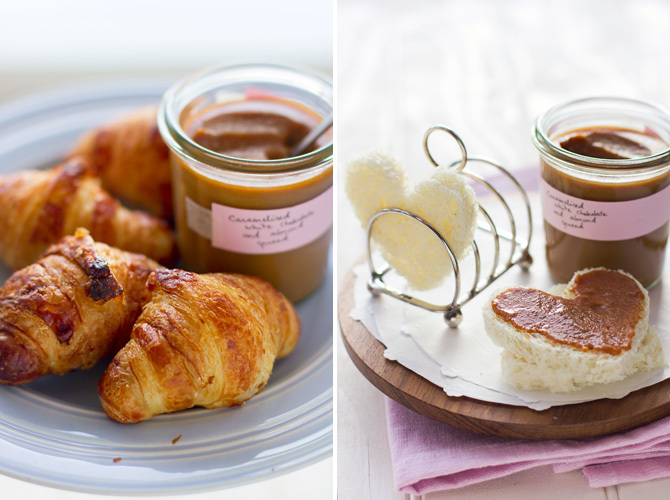 BTW, that caramelised white chocolate spread looks amazing. I spotted it on Tastespotting and couldn't resist. Can't wait to try it out! Pille, ma lugesin ka seda kakaovõi juttu, aga lõin käega, sest kakaovõid mul kuskilt juurde võtta polnud. Ja ega midagi hullu juhtunudki, tulemus sai ehk natuke kuivem, aga kuna segasin selle teiste ainetega kokku, siis ei olnud see määrav. Kasutasin Kalev "White" tahvlit. Just stumbled upon your blog and am so glad to have found it. Your photography is just lovely and this spread looks incredible. I have never thought to try and caramelize chocolate! Cannot wait to try this. 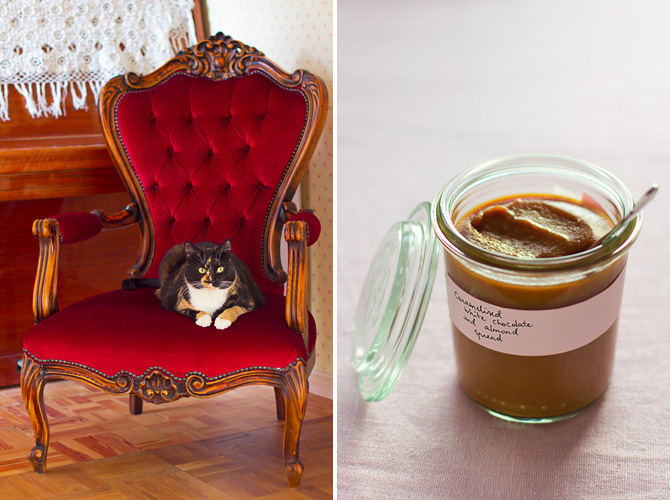 and thanks for posting the caramelized white chocolate spread! I am so going to try that out! Only have one shelf of cookbooks, but once we figure out what kind of shelving/cabinetry we will have in the dining room, I will start collecting more I'm sure!